When Jesus gave the bread and wine to His disciples at the Last Supper, He was performing the rite that had begun with Melchizedek. Melchizedek was both king and priest as we can see in the above verse. Jesus is also our King and Priest Who followed after the order of Melchizedek (Psalm 110:4; Hebrews 7:1). 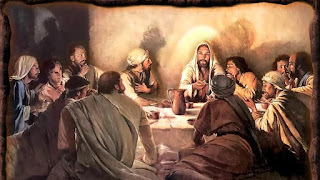 The approximate date of the Last Supper can be worked out by reading the scriptures. ‘This month will be to you the beginning of months. It will be the first month of the year to you’ (Exodus 12:2). ‘The first month is the month Nisan’ (Esther 3:7). ‘In the first month (of Nisan), on the fourteenth day of the month is the Lord’s Passover. On the fifteenth day of this month (Nisan) there will be a feast and for seven days you will eat unleavened bread’ (Numbers 28:16 & 17).